Please view our video here. 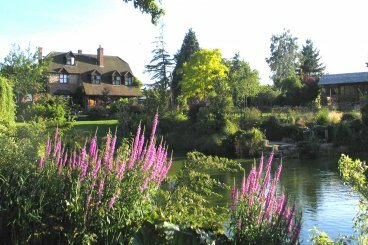 We are ideal for the tourists or the business guests, in a peaceful location, on our 300-acre active working farm, surrounded by gorgeous gardens and lakes. This beautiful wooden lodge offers unique charm and tranquillity in an idyllic setting. Lakeside Town Farm is on the edge of a small rural village, between Oxford and London, at the foot of the Chiltern Hills, in an area of Outstanding Natural Beauty. We are down a quiet lane with no passing traffic. For peace and privacy, stay in our unique self catering garden cabin by the lake, with up-to-date decor in 'shabby chic' style. Lovely calming views over the pastures and park land with sheep and cattle peacefully grazing. Enjoy an evening glass of wine on the veranda watching the ducks, red kites and an abundance of wildlife. Wonderful for honeymooners and romance! With its gorgeous gardens and lakes, the cabin is perfect for a relaxing break and has been featured on TV’s Gardeners World, the Oxford Channel,and in the Sunday Times travel section. We provide a welcome pack for your first mornings breakfast and there is a walkable pub serving good food in the village. Chinnor is 2 miles away where you can stock up on other provisions. The lodge cooking facilities are microwave, fridge, 2 ring hob, kettle, toaster. Local walkable pub serving very good food. There are an excellent selection of restaurants, inc. Indian, Thai, Italian, Le Manoir aux quats saisons and cosy pubs, just a short drive away. We are in the middle of the Midsomer Murder Trail, and Inspector Morse country. Many National Trust properties are throughout our area. Ideally based for walks through our beautiful Chilterns or along the Ridgeway. We do have walking maps. Day trips to Bath, and Stonehenge.